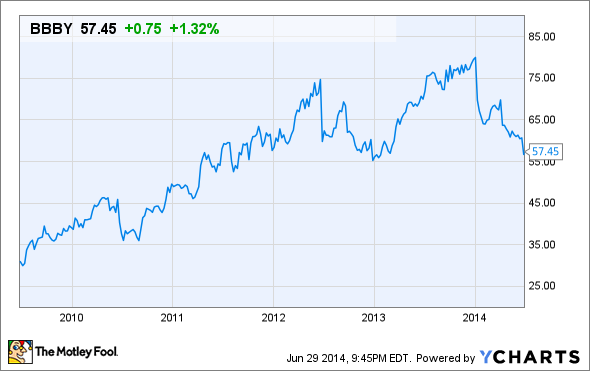 Why Investors Shouldn't Lose Faith in Bed Bath & Beyond Inc. Bed Bath & Beyond Inc. has hit a growth slowdown, but this still looks like a solid stock for long-term investors. After years of fairly predictable growth, home furnishings giant, Bed Bath & Beyond (NASDAQ:BBBY) has hit some turbulence recently. Plenty of people on Wall Street seem ready to give up on the company and some of my colleagues here at the Fool feel the same way. Many investors appear to be giving up on Bed Bath & Beyond. Today, many investors are more attracted to Bed Bath & Beyond's upmarket competitor, Williams-Sonoma (NYSE:WSM). In some sense, this isn't very surprising considering Williams-Sonoma's higher growth profile. However, Bed Bath & Beyond is still probably the strongest brand in the home furnishings category, and long-term investors are likely to be rewarded for their patience. For the past several quarters, Bed Bath & Beyond has posted fairly disappointing revenue, earnings, and margin trends. Earnings estimates have been falling, causing a significant correction in the stock price. Bed Bath & Beyond 5-Year Stock Chart, data by YCharts. Bed Bath & Beyond's management has attributed the margin pressure to two factors. On one hand, customers have become more price-sensitive, and are trading down to lower-priced items and using more coupons. On the other hand, Bed Bath & Beyond's costs are rising due to investments in new technology infrastructure to improve online and "omnichannel" sales. These headwinds have caused a sharp slowdown in revenue growth at Bed Bath & Beyond. As a result, pre-tax earnings declined last year, although heavy share buybacks allowed the company to grow EPS. Last quarter, net income fell so much that EPS remained flat year over year at $0.93, despite Bed Bath & Beyond's ongoing share buybacks. BBBY Revenue (TTM), data by YCharts. Whereas Bed Bath & Beyond has been struggling just to keep comparable-store sales above the flat line recently, Williams-Sonoma has been sailing along. Last quarter, Williams-Sonoma posted comparable brand revenue growth of 10%, powered by 17.2% growth in direct-to-consumer revenue. This allowed it to grow EPS more than 20%, from $0.40 to $0.49. However, while the trends may favor Williams-Sonoma, Bed Bath & Beyond is still the better business on an absolute basis. Despite some margin deterioration that has occurred in the last two years, Bed Bath & Beyond still has a significantly higher profit margin and a higher return on assets than Williams-Sonoma. WSM vs. BBBY Operating Margin (TTM), data by YCharts. 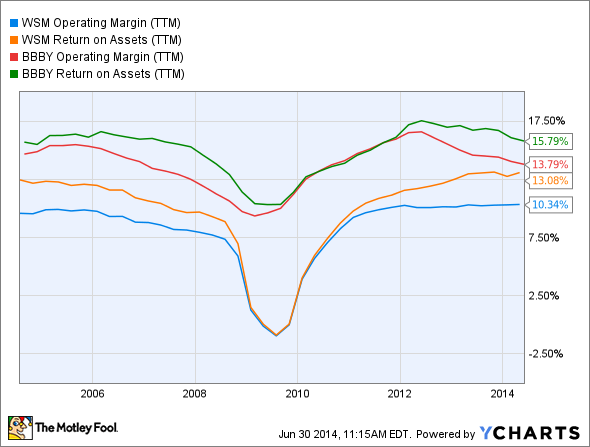 Furthermore, as the chart above shows, Bed Bath & Beyond was solidly profitable throughout the Great Recession. Even at the bottom of the recession, Bed Bath & Beyond's operating margin was similar to what Williams-Sonoma has been posting recently. Meanwhile, Williams-Sonoma plunged into the red during 2009. Williams-Sonoma appears to have a more cyclical business than Bed Bath & Beyond, so much of its recent improvement may be attributable to strengthening consumer sentiment among its relatively wealthy clientele. 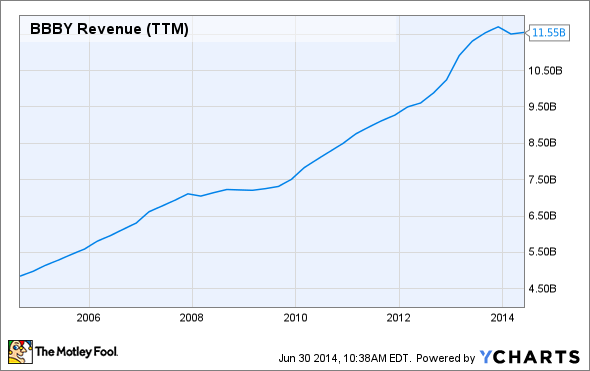 Williams-Sonoma appears to have a much more cyclical business than Bed Bath & Beyond. Meanwhile, Bed Bath & Beyond remained strong throughout the Great Recession, but it will need to wait for a broader housing recovery to return to growth, as consumers are most likely to make big home furnishing purchases when they are moving into new homes. Despite another quarter of weak sales growth, I still think Bed Bath & Beyond is a good bet for long-term value investors. The company's management expects sales growth to strengthen somewhat later this year. There are still opportunities for adding new stores, and Bed Bath & Beyond's technology investments could drive a significant acceleration in online sales over time. Williams-Sonoma is a very good retailer as well. Its higher growth rate is certainly attractive. That said, it commands a valuation premium, trading for 22 times expected current-year earnings, compared to 12 times earnings for Bed Bath & Beyond. However, investors shouldn't look at Williams-Sonoma's stronger growth and assume that it is eating Bed Bath & Beyond's lunch. Bed Bath & Beyond still has a higher profit margin and earns higher returns on capital, and this bodes well for its long-term success.